Hindu temples should be safeguarded at any cost to show the future generation that Tamils have a several centuries-old history in the country, said speakers at the seminar. Trincomalee Cultural Officer, Mr.S.Mahendrarajah, said in his welcome speech that from the Koneswaram temple in the eastern port town to Agathiyar Thapanam founded by Saint Agathiyar, and now the ruins of the Muttur south Hindu temples in the district speak of the pristine glory of Tamils in the country. Saint Agathiyar had founded a Tamil medical university at Kanguveli several centuries ago and now it is called Agathiyar Thapanam, he said. 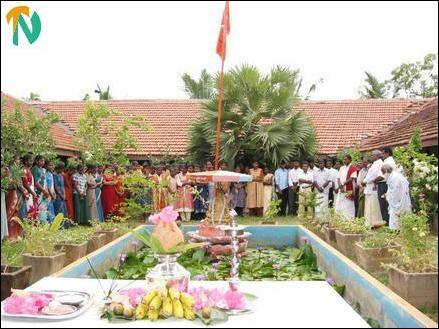 At the commencement of the event, a leading Tamil woman scholar in Sri Lanka, Vidwan Ms. Vasantha Vaithiyanathan, hoisted the Siva flag while about fifty Saiva teachers sang Saiva Thurumuraigal composed by Nayanmargal (Tamil saints), sources said. 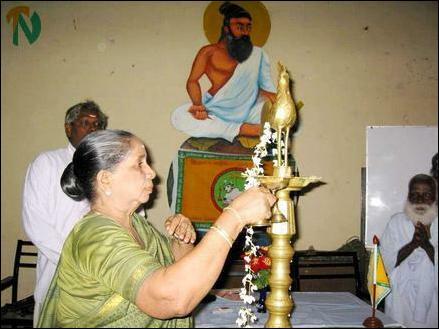 She later inaugurated the seminar by lighting the traditional oil lamp. Presiding over the event, Mr.V.Wikramaraja, Assistant Director of the Hindu Religious Affairs Department, said that all Ara Neri (Saiva religious schools) institutions would be brought under one unit under the Ministry of Hindu Affairs with effect from January 1st next year. Messrs S. Arumainayagam, Trincomalee town and gravets Divisional Officer and Kuralamutham K.Vinayagasothy, Trustee of Uppuveli Sivanantha Thabovanam were the guests of honour at the event. The Department of Hindu Cultural Affairs donated books to libraries functioning in local authorities and Hindu religious institutions in the Trincomalee, sources said. Saiva teachers participating at the one day seminar are seen. Guests at the seminar praying after hositing the Saiva flag. Vidwan Ms Vasantha Vaithiyananathan inaugurates the Saiva teachers ' seminar by lighting the traditional oil lamp . Hindu Religious Affairs Department Assistant Director Mr.V.Wickremarajah is seen on the left.